On April 12, downtown Lincoln gained a full-time comedy club. 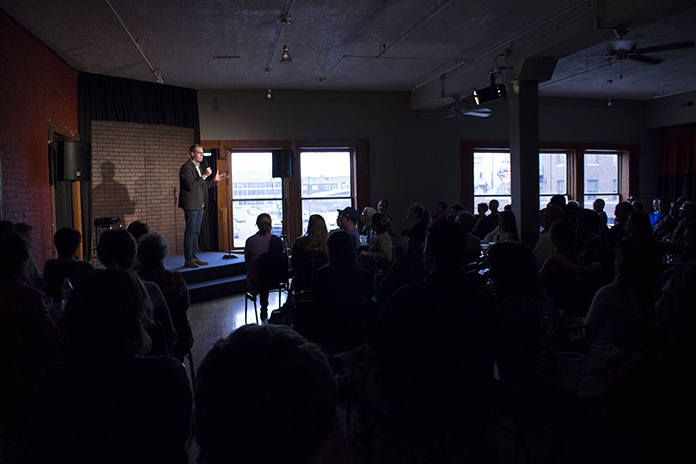 Since its opening, The Comedy Loft, located on the second floor of the Creamery Building in the Haymarket, has earned recognition as a top-notch venue in the comedy community. Some upcoming comics for the venue include Michael Joiner, Matt Geiler and Elliott Threatt. To learn more, Downtown Lincoln asked The Comedy Loft some questions via e-mail. Downtown Lincoln: What made you want to open The Comedy Loft? The Comedy Loft: One of the owners is a former standup comic and hosted a late-night talk show in Lincoln in December. There was a lot of interest in the show and that blossomed into working on the foundation for the club. DLA: What types of comedy are you aiming to bring to The Comedy Loft? CL: We have booked national headliners seen on Netflix, TV, HBO and Comedy Central. We also will showcase some comics who got their start here in Nebraska. DLA: Why open a place like this in downtown versus another spot? CL: One of the owners created The TADA Theatre, winner of the DLA Impact Award for Downtown Development. Over its 10 years it has brought people downtown to enjoy theatre, so being its neighbor made a lot of sense. It has helped grow the second floor of the creamery building into offering a wide range of entertainment not found anywhere else downtown. DLA: How has the reception been so far? CL: Very good. The entire opening weekend sold out. It’s still new and we need Lincoln’ support to keep it growing! Nationally comics have heard about it and want to play it. It is a top-notch room and classified as an “A” room! DLA: Anything else you'd like to add? CL: We are excited to be part of Downtown and to bring a full-time comedy club back to Lincoln after so many years. We are also partnering with Park and Go, allowing for all patrons to receive prepaid $5 parking when they want to go see a show at The Comedy Loft. It’s a great and affordable night out and there is no better way to watch comedy then to see it live!